Editorial: Just milk all the way? - Jacob Ninan expresses concern about many believers not being able to grow up. Above us, with us, in us - This God who is above us, with us and in us is there for us all through our ordinary times, points out Kuruvilla Chandy. His leading in a mysterious voyage - God has a big picture for each one of our lives which is beyond the understanding of human intellect, encourages Ebinesh Jezreel. Prayer - The greatest mode of communication that God has given for us to be in touch with Him is prayer, reminds Avinash Singh. 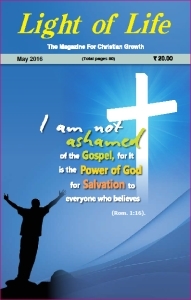 Showers of blessing - Are you blessed with God's showers of blessings, asks Vimal R. Ram. So near, yet so far - Are we, regular church-goers far from the Head of the church, asks Suresh Manoharan. The bloodshed on His brow - In the spiritual journey of our lives, we may have to face the bloodiest battles being won when we are on our knees, writes Susan Ann Samuel. Who is my neighbour? - Every one of us can experience a loving relationship with God, writes Vivek Salins.